What was it like being a neutral in the First World War? Probably the best known states which maintained their neutrality for the entire conflict are Switzerland and Holland, but there were several others such as Sweden, Spain and Norway. Switzerland and most other neutral states in Europe went through three phases during the war. In the first months of war, there was a fear of invasion. Then until mid-1916, neutrals often profited from trade with the belligerents. From the end of 1916, the war began to have negative effects even on the neutral countries, causing inflation, civil unrest, and shortages of food and raw materials. The duties of a neutral state were set out in the 1907 Hague Agreement, which permitted a neutral to export goods to the belligerents, including arms. Wounded or sick soldiers could travel through a neutral, but other troops from either side were not allowed to enter the country. The Swiss could not join a military alliance and had to treat all states equally in diplomatic relations. Left: Many Swiss (especially those in Swiss-German speaking areas of the country) had pre-war links to Germany. 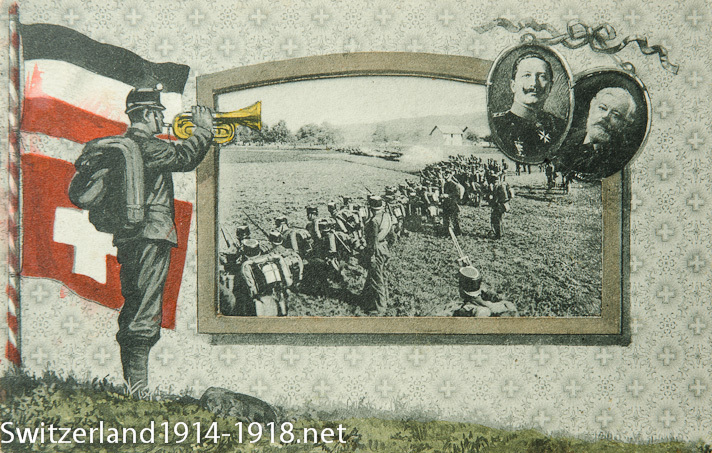 This postcard marks the visit by the Kaiser (the German emperor) to Switzerland in 1912. The main photograph shows Swiss soldiers on manoeuvres. Many Swiss amongst the 73% of the population who were German-speakers had strong links to Germany dating from before the war. Wealthier Swiss often spent a year in Germany as students, and some Swiss army officers had received training there. French-speaking Swiss (22% of the population) had similar but looser links with France. Germany’s invasion of Belgium – a fellow neutral – lost her some Swiss support. In October 1914, the government suspended two newspapers and cautioned five others for un-neutral attitudes. 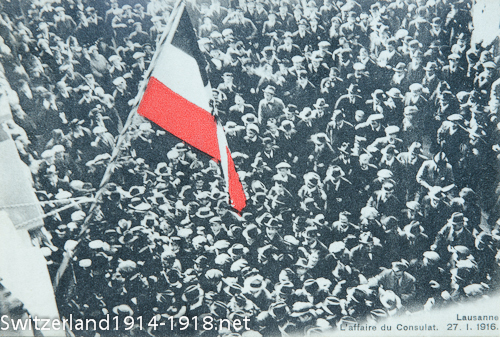 Left: A Swiss wartime postcard showing the crowd in French-speaking Lausanne outside the German consulate. Members of the crowd tore down the German flag to show their disapproval. The occasion was the German Kaiser’s birthday, on 27 January 1916. Click here to go to the next section on wartime trade and politics.